The Latin for furniture, 'res mobiles', is based on the word mobile. 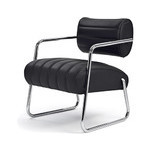 Eileen Gray took this very literally. She loved light, functional furniture that one could move around without problem. 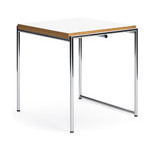 One can lift this table 'for all occasions' as if it had a handle and carry it exactly to where one needs it. 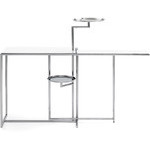 Like the Adjustable Table E 1027, it is constructed such as to slide the base under the bedside or armchair. Thus breakfast or bedtime reading is within comfortable reach. Authorized by The World Licence Holder Aram Designs Ltd, London. 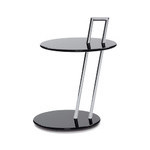 The Occasional side table is offered with a round or rectangular table-top. 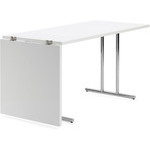 The frame features chromium-plated steel tubing and MDF high-gloss lacquer finished table-tops in your choice of colors. round: 22.4" h | base: 14.2" dia. | top: 15.7" dia. 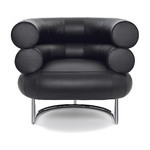 $2,233.00 + free shipping in the continental U.S.